Working closely with RUNA Workshop for the second time, Drophouse fabricated and installed multiple mill work and steel items throughout the game. Drophouse's work can be seen in many other places in the project, but could not be shown here due to the secrecy of the games. 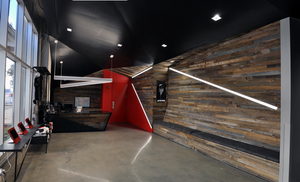 The multifaceted lobby was the show piece for Drophouse utilizing reclaimed fence wood siding and blackened steel for this LEED certified project in downtown Austin.